When you learn to surf, you should know that it’s not just waves that will float in your way. More so, your entire attitude to life will change immediately. You will find yourself in different places looking for waves, heading to different countries, searching for perfect spots. Once you’re hooked, there is no coming back. You will be on the search always and everywhere. Keep in mind that being landlocked is the worst thing you will ever feel. As a beginner you should know this: Surfing is one of the most complex sports in the world. It is quite a challenge to enjoy first achievements. A ‘wipe-out‘ is what surfers call when you don’t succeed at catching a wave and you fall. This can be totally frustrating. In surfing, you will wipe-out again and again. 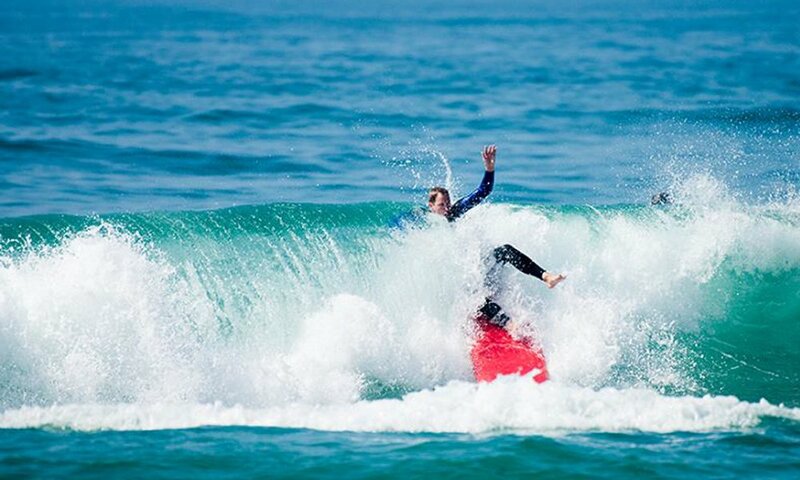 Even the best surfers get hit by unexpected, huge waves and wipe-out. But always remember: Never give up. Surfing will hurt you once, it will hurt you twice – but one day you will have a smile on your face that cannot be removed. You will be stoked! You will have the best feeling when you surf that one wave you will never forget. Stay positive, patient, be passionate and practice hard. Surfing is not just about tanned bodies or hot booties. When you make your way from a beginner to at least an intermediate surfer you should know how to position your body on the surfboard. First of all, close your legs. Most beginners just hang their feet next to the tail – wrong! Watch the other surfers, do it like them, put your feet together. Another mistake is posture – don’t lie on your board like a flat pancake. Tense your body, thrust out your head and chest. It is very important to be flexible and powerful in the water. With this pose you just need to paddle strong and calm. When you make it out to green waves, there are several facts you definitely should know. The ‘line-up‘ is the place where surfers wait for waves. Always face the ocean’s horizon! There are sets, set breaks, clean up sets and usually a lot of surfers. It’s important for you to know: your playground is constantly changing. Waves have a life of their own, never controllable, just rideable. Learn how to read them, learn where you need to sit with your board and when it’s the best time to paddle further out so the set won’t hit you. Tides, wind and swells affect the waves. Make sure you know what is under you and your board. Sand, reef or rocks make different breaks for different levels of surfing. And if you don’t know – just ask. There are several apps and websites where you can check conditions and beginner friendly spots. Keep in mind that wave theory is a complex physical field, but it’s better to know at least a few basic facts. As mentioned, waves are natural, strong and wild entities that have their own rules. Always be aware that surfing is one of the most dangerous sports in the world. I don’t want to tell you all the stories about wipe-outs or getting kinda lost in the ocean. Even if you won’t see it from the beach, most of the time there are currents inside the water, moving in different directions. Sometimes they are very strong. In a worst case scenario, you will lose your way back to shore. Make sure your arms are strong enough so your paddle technique will bring you back again. One of the first mistakes are overestimating oneself. Little by litte, surfing needs time. As a beginner, the best thing you could do is find a surf teacher! They will tell you everything you need to know for your first sessions. Stay at a surf camp to get the most information during a short time. 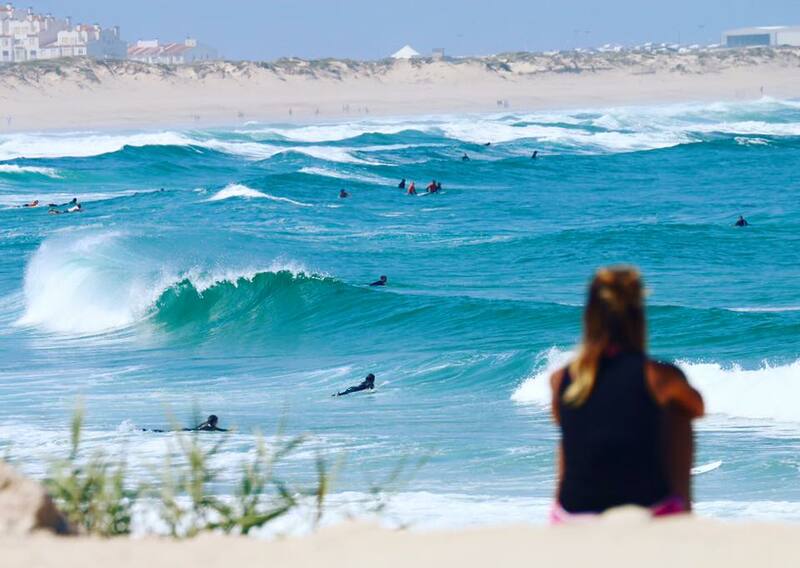 Portugal would be perfect to start your surfing career or to improve your surfing skills. If you make your way to Ericeira, you will find yourself with a range of beautiful spots for different levels. The ‘Chill In’ will guide your way during your surf holidays and will make sure that you won’t get lost in the ocean, just get lost in the place. 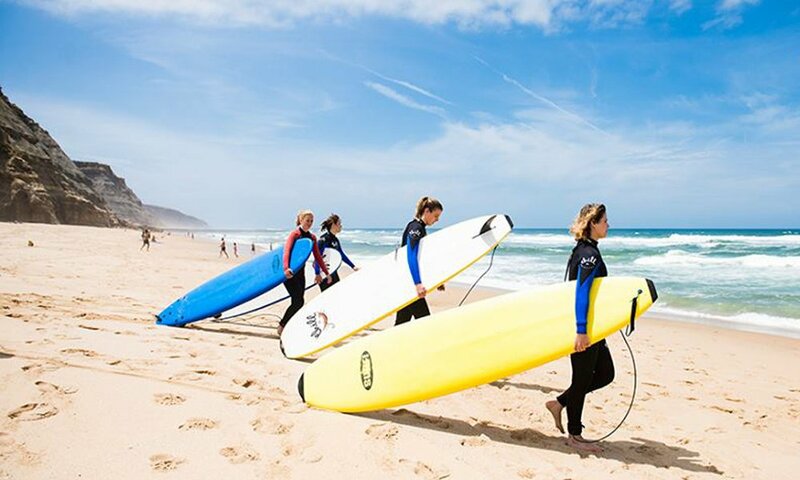 The Surf Camp works in cooperation with Luex and is located close to Praia do Sul and Foz de Lizandro. The hosts provide you with expert local knowledge that guarantees you’ll be surfing the best waves available on any given day. 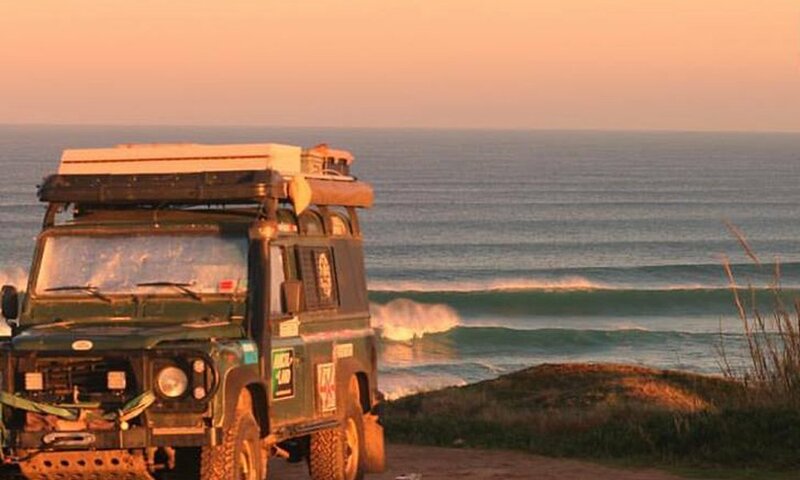 If you want to go to world famous Peniche, which is known for Europes best waves, stay with the ’Ferrel Surf House’ Team. Just in case you want to watch real big waves, the guys from Ferrel will take you to the world-renowned big wave spot Nazaré. This is where surfing takes on a whole new level. Watching surfers charge this unimaginably huge break will give you a new found respect and appreciation for the sport and the ocean. All in all – don’t be scared, don’t lose your head, but don’t forget the risks; stay focused! Don’t drop in! The worst thing you could do in the water is steal someone’s wave. If you don’t have priority on the wave, stop going for it. 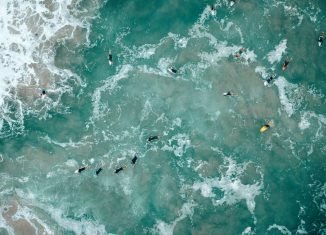 There are some rules in the water, which you could call surf ethics. When you start surfing on your own, study and honour the surfing rules. Waves are normally meant to be ridden by only one surfer, who catches the wave closer to the peak than the others. Look right and left before you do your ‘take-off‘. If you won’t be the one with the longest ride, you are not allowed to get in the wave. In some spots the line-up is crowded with combative surfers. In that case even free surfing becomes a competition. If you’re not strong enough, you won’t make it to even one wave. The right surf equipment is very important. Different kinds of waves demand different kinds of boards. Mellow waves, steep waves – for every undulation there is a perfect shape. As a beginner choosing the right surfboard can make the difference between having 15 or 0 waves during your session. As a beginner, you should rent a soft top with a lot of volume. Bigger boards don’t need to be paddled hard and it is easier to catch waves. Your core will find a better balance because the so called ‘foamies’ have great stability in the water and are the perfect surfboards for beginners. The knowledge about length, width and thickness will guide your way to a suitable board. Take care of your surfboard because fiberglass is very sensitive. Last life hack for today – when walking along with your board hold your leash in your hand, don’t let it drag along the ground behind you; do it properly, do it with style! Change the world, it needs it.